Get more of the space you need to spread out, relax or work at the smoke-free Comfort Suites UCF Area - Research Park hotel in Orlando, FL. 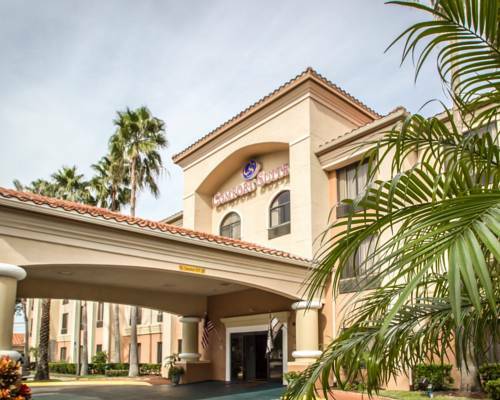 We are located near University of Central Florida and Orange County Convention Center. For your convenience, we have meeting space available and our business center offers copy and fax services. Other amenities include free WiFi, free hot breakfast, an exercise room and laundry facilities. Our spacious suites feature convenient AC and USB outlets, microwaves, refrigerators, coffee makers, TVs, irons and ironing boards. Select suites also offer a hot tub bathtubs. Also, earn rewards including free nights and gift cards with our Choice Privileges Rewards program. Must have adult 21 years or older in each room. Credit Card name and guest name must be the same. All Comfort Suites are smoke free.